I’ve figured it out. 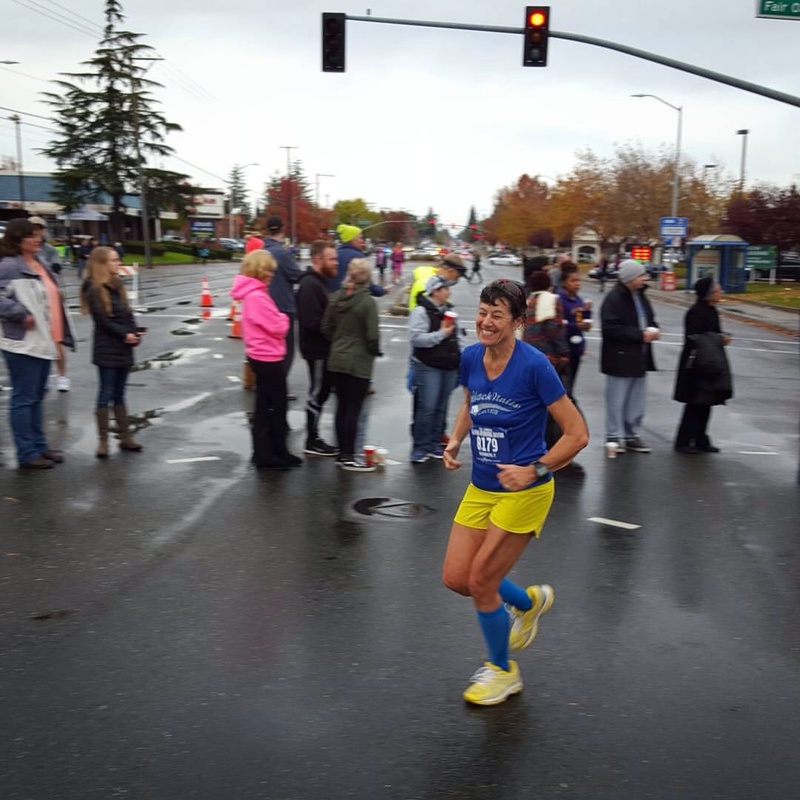 In spite of claiming to have a love-hate relationship with the marathon distance, this I know to be true: the California International Marathon, held each year in the Sacramento area, is a much loved race, and I am one of the ones who loves it. It’s big enough to be an exciting event, drawing lots of talented runners, yet small enough to have that home town feel. It may be that it has a special place in my heart because it was the first marathon that I ever attempted a time goal. It was my second marathon, and my first Boston Qualifier in 2008. But it’s not just that. There is something special about this race and I’m never disappointed. Crowd support, often in freezing or rainy temps, is always there! So, it’s been my 4th, 8th, and 12th marathons as well. So, why was I there, just nine weeks after running the St George Marathon? It all goes back to the day after that race. Erin, Pete and I were laying around, rehashing the event. While I was pleased I had run another BQ, we were all in agreement that my time would not likely make the cutoff for Boston 2017. If you’re unfamiliar with how things work, just know that it’s no longer enough to run a qualifier. Competition is still stiff enough that not every qualifier gets in. There is a cut off. For 2016, you had to beat your time standard by 2 minutes and 28 seconds, I made it by 11:28. But my SG time, just after the window for 2017 opened, with 99 seconds to spare, was unlikely to make it in. I am signed for Boston 2016, it is true, and I can re qualify for the next year there. But I was thinking about the pressure I would be under to do so…not that I have to run 2017, but gee, knowing my besties were already in ( Erin had killed it at SG and my buddy Paula was in too) I wanted to get this taken care of! So Erin mentioned that the sold-out CIM had a late entry option for runners who had run certain times this year and I was in there. And she would even drive me to the buses that morning so I wouldn’t have to get a hotel. With friends like this, you don’t need a little devil sitting on your shoulder, urging you to do these things, that’s for sure. My goal was to come in somewhere around 4:05 or better. After getting the go ahead from Coach Andy, I began a training cycle that was fueled by determination like never before. I can’t quite explain it but I began pushing myself in ways I had not done for a very long time. I had some great long runs and I felt my endurance improving. CIM would not offer the downhills of Mountains2Beach or St George, so I knew that I had some work ahead, but I put in the work! The night before the race, Howard and I attended an event put on by St Ignatius Church in Antioch. Howard asked Father Robert to give me a special blessing for the race. He laid his hand on my head and said “Roses are red, violets are blue, don’t break a leg, and maybe you’ll win, too.” I’ll spare you the suspense…I didn’t win. But I hardly had any pre marathon anxiety at all! I started off with the 3:55 pace group and intended to hang with them as long as possible. I ran just ahead of them for the majority of the race, holding just under a nine minute mile. There was some rain, but not enough to be a factor. There was no wind. Excellent! I knew Pete and Erin would be at the half way point. I was so excited to see them at mile 13. What a boost! By mile 21, I was still with my pace group, but I could feel it getting hard. I knew I was going to slow down. How much, I didn’t know. I intended to use my mental training I have worked on so much to get me through. Unfortunately, as determined as I was, I could not keep up the pace I had hoped, even factoring in my anticipated need to slow down. I fought the good fight through mile 22, then severe fatigue took over. I kept running…just not within the parameters I had set. My goal had been no ten minute miles, but I had a few. They ate away at my PR, then my secondary goal of a sub 4. And while I lost a lot of time, I did finally come in at 4:01:53. I look at it as proof that while I was aiming for the stars, I may have come up just a bit short, but my efforts enabled me to get to the moon. My time accomplished what I set out to do…8:07 to spare for a BQ. All week since the race, I’ve been tearing up just thinking about it. It wasn’t so long ago that I was wondering if I would ever cross the start line of another marathon. It took over two years to get from marathon #8 to #9. And within a year, I’ve now finished #12. I’m feeling incredibly grateful. Like this shouldn’t be happening for me. But it has. I’m going to find a way to give back. Because I’ve been given so much. I appreciate the support my husband Howard has given me. I know he doesn’t really understand the concept of running 26.2 miles but he knows it’s important to me for some reason. I’ve thanked Pete and Erin many times for all they have done for me but it will never be enough. Thank you again. And Paula and Mike. Always with me, always supporting me every step of the way. And Andy and Pauline. Having Andy as my coach has enriched my running in so many ways. I hope I never go back to going it alone. And a special thanks to Gina and Fatma for cheering me on at the finish line! I know I could not have done this without my village!